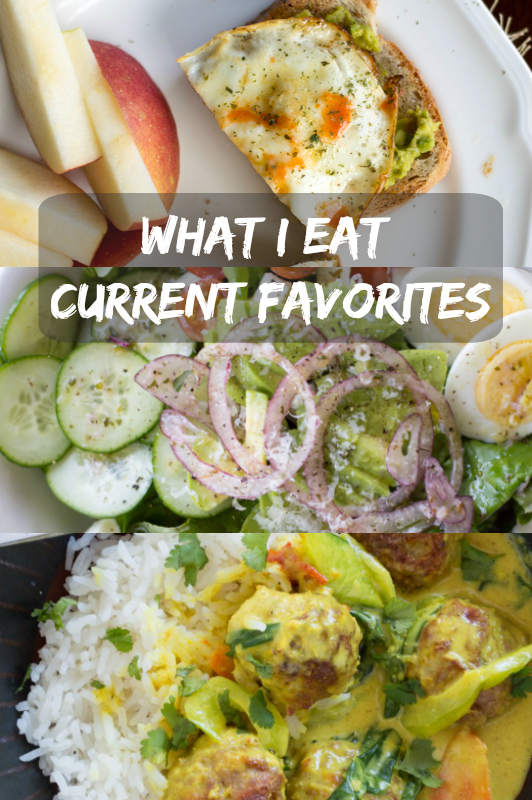 Another peak into what I eat in a day with my current favorites that have been on repeat! 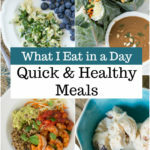 These meals and snacks are simple, easy, and healthy! Hello again friends, and Happy Friday! Not just any Friday, it’s Friday the 13th! Any superstitious people out there? Not me… I love a good Friday the 13th. In fact, 17 years (whaaaa?!) ago today, Kyle and I started “dating”. I say “dating” loosely because we were only 13, and dating at 13 meant chatting online and talking on the phone. Makes me laugh when I think about those days… which don’t seem that long ago. ? I’m feeling very nostalgic on this rainy, dreary day. <– See, I can’t not mention the weather. ? Anyway, when I think back to being young and in love, I smile. The simplest things seemed so dramatic back then. Fighting over nonsense, waiting for the phone to ring and then talking for hours, actually excited to go to school… ahhh those were the days. I’m happy the melodramatic moments are over, though. Alright, enough with my trip down memory lane, let’s jump into another “What I Eat”! 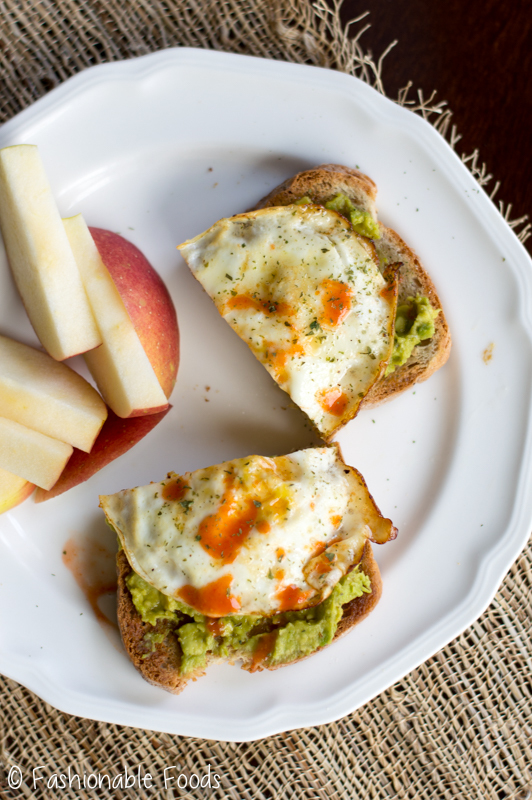 Avocado and Egg Toast. Who doesn’t love avocado toast these days? I’m a huge fan when it’s topped with a fried egg cooked completely through and hot sauce. Not sure what it is with me and not-runny fried eggs, but I’ve been loving them lately. I love a good runny yolk from time to time depending on how I’m eating it. When I have a breakfast sandwich or topping my toast off with an egg, I like it cooked through. It’s just so much easier to eat and less messy… I hate when there is egg yolk dripping down my chin! It’s apple season, so of course that’s my breakfast fruit of choice at the moment. That one is a local autumn crisp apple – perfect balance of sweet and tart.. and super crisp! My favorite kind of apple. 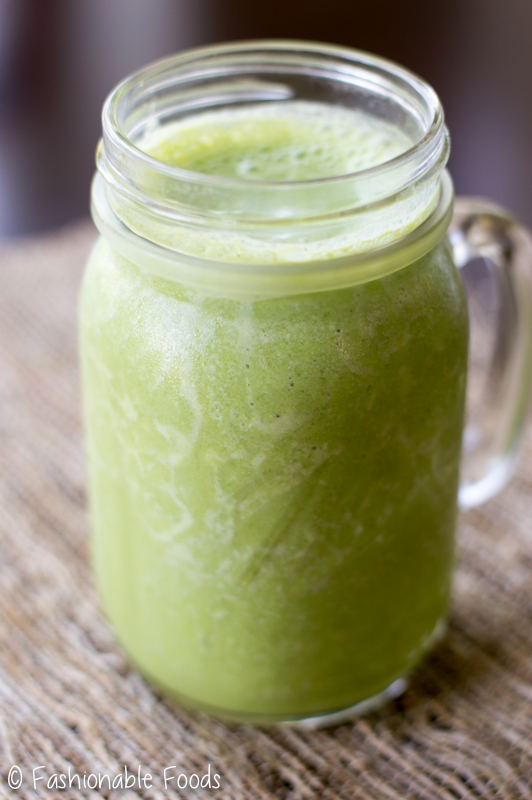 Pineapple and Kale Smoothie. I threw this together when I wasn’t quite hungry enough for lunch, but needed a little something. I’ve got tons of kale growing in the garden, so I blended a bunch up with frozen pineapple, coconut water, almond milk, and hemp seeds. So simple, yet nice and sweet from the pineapple and super refreshing! The hemp seeds provide fat and protein, which is necessary in smoothies to help keep your blood sugar balanced and allow you to absorb those fat soluble vitamins. 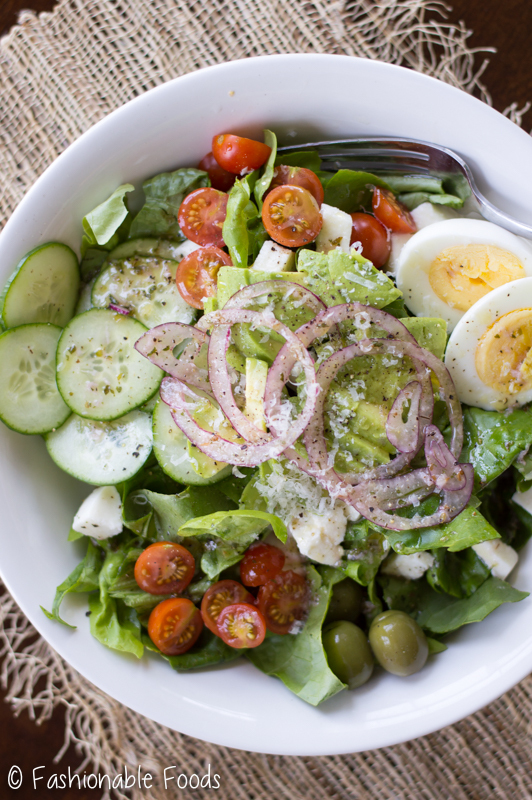 Tossed Salad with Red Wine Vinaigrette. I’ve been so obsessed with this salad lately. I eat it almost daily whether it be for lunch, or a smaller version alongside dinner. It’s so simple and SO SO SO good. Thinly Sliced Red Onions, marinated in the dressing <– Amazing! Shake all of the dressing ingredients in a mason jar and then add in some of the sliced onions to marinate. The marinated onions are so amazingly good, you’ll want to put them on everything! 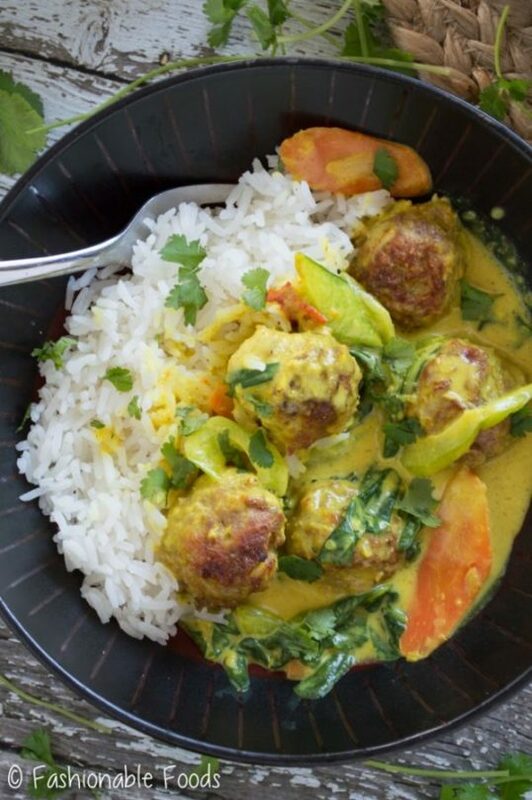 Thai Yellow Curry Meatballs. This is one of my favorite recipes that I’ve shared, ever. I say that about a lot of recipes.. which is a good thing since I’m sharing them all with you and you want to know they are good. ? Buuuut, these meatballs are at the top of my favorites. I’ve made them several times and always freeze some extra to have on hand when I need a quick meal. I’ve always got homemade curry paste in my freezer, too. Add some veggies, a can of coconut milk, and some rice (or cauliflower rice) for serving and you’ve got a delicious and healthy meal. I forgot to take a picture of this on the day I made it, so I’m just using the photo from the blog post. The only difference was I used broccoli instead of the bok choy in the recipe. You can really add any veggies you want or have on hand. I’m already wanting to make this again, it’s just that good! 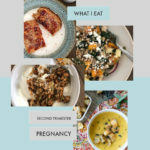 I hope you enjoyed another edition of “What I Eat” and take away a few ideas from my current favorites. Have a fabulous weekend and I’ll see you back here on Tuesday! ✌? I'm Keri: the passionate foodie behind the blog. I created Fashionable Foods to share fresh, homemade food with a creative twist. I live in Delaware with my husband Kyle and my cat Basil. Favorite things include beach days, wine, and popcorn.